Does it mean that your food is grown organically without pesticides and hormones? Does it mean that you know you will always have food on your table for your family because you can supply it yourself? Maybe it means you have grown enough food to collaborate with family and friends on bartering and trading in case of a crisis? The United Nations’ Committee on World Food Security defines food security as “the condition in which all people, at all times, have physical, social and economic access to sufficient safe and nutritious food that meets their dietary needs and food preferences for an active and healthy life”. If we look at US statistics by the USDA in 2016, the good news is that 87.7% of households in the US are food secure. The bad news is that leaves 12.3%, or 15.6 Million people, without food security. The numbers increased after the recession in 2008 (people lost jobs, economy lost money, etc). 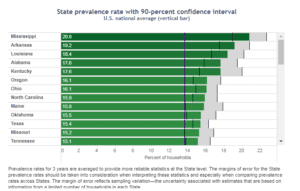 According to these numbers it looks like the households with the most food security are in the south (MS, AK, LA, AL being ranked highest) and the state with the highest amount of food security is in the north (ND). The south – where almost anything grows year round – has the most food insecurity. 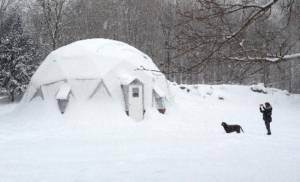 The north – where it is hardest to grow food year round – has the least. Something strange is going on. We can blame it on grocery stores, because in the modern day growing your own food is not mandatory. In fact, few people in the city do it anymore. 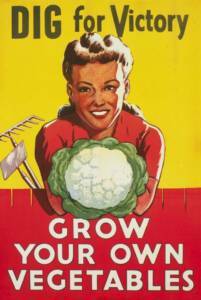 After WWII and the Victory Gardens, most people shop for food, not grow it. Maintaining a garden is not on the priority list when so many other things are demanding our time. However, the fruits and vegetables available in grocery stores travel long distances, which is bad for our environment. It is not necessarily free of pesticides and chemicals, no matter what the “organic” labels say. In addition, grocery stores only carry a certain amount of food. 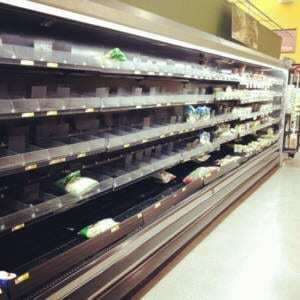 We have all seen the pictures of what happens in a grocery store when a natural disaster happens – there is no food on the shelves! 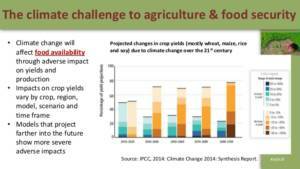 Global warming also has a huge impact on food security. Devastation in the past few years that hurricanes have done, as well as flooding in certain areas in the southern states have been on every news channel in the nation. These forms of damage destroys crops for farmers and important infrastructure that drivers need to deliver food. Food security also means having good quality food on the table for your family. Having food free of pesticides, chemicals, and hormones is incredibly important to our health and well-being. Even though certain chemicals have been banned in the US, they are not banned in other countries where certain food originates. The more the pests develop resistance to certain chemicals, the more costs will increase in order to maintain the same output of food production. Higher costs mean less people will be able to afford them, and cheaper foods will win once again. This equals less quality food on your table. 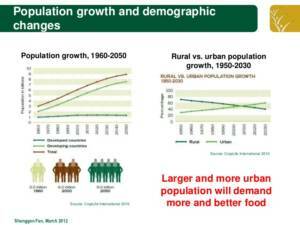 The population of the world is growing exponentially, and food production is just not keeping up. In the last 50 years the population has doubled, and is not expected to slow down in the next 50. Providing food for all of these people has many challenges, such as finding enough land to grow crops on or raise meat. Cities are spreading and we are losing valuable agricultural space needed to produce the food. Many experts say that if meat consumption is not reduced, it will threaten food security. Too much land is being used to grow food for cattle, and not for humans. Many farms have changed into mass production agricultural farms to try and feed the masses of people on the earth. They grow the same crop year after year. Plant diseases are a threat, and having a variety of crops will allow them to cope with the changes in the climate. However, if more and more farms become a single crop farm, they will be challenged with these changes. While we can’t fix all of these problems, we can control what goes on our tables. 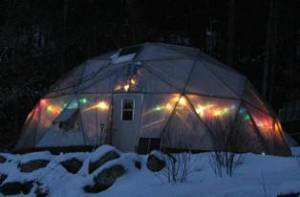 Having a place to grow your own food year round will allow you to cope with the challenges that the rest of the environment will face. Pesticides, climate change, and world population are not issues in your Growing Dome. You will know how much you need to plant to feed your family quality healthy food. A variety in your diet will no longer be a problem, nor what is available at the grocery store. You will have control over your food, and therefore your health. If you are holiday shopping this year, consider giving the gift of food security for your family.